Iodine is one of the most important minerals needed for thyroid, metabolic, immune system, neurological and digestive health. Contact us for more information! Map of the "Goiter Belt"
IODINE (lacking the extra electron in it's outer shell) binds to breast, prostate and stomach. IODIDE (has an extra electron) binds to the thyroid glands, salivary glands and the skin. A combination is required for supplementation to get a better systemic effect. Every cell in the body needs and uses iodine. Every 12 minutes, all the blood flows through the thyroid gland so that it can purify the blood and kill bacteria and viral infections. Iodine first goes to the thyroid gland for healthy thyroid function. The thyroid gland contains the bulk of iodine that stored in the body, but other glands also contain significant amounts of iodine. Females breasts have the second highest concentration of iodine in the body. The requirement for iodine in the body at puberty goes up tremendously for girls. This is also so that breast milk will be disinfected when we nurse children. Studies have shown that breast cancer is the result of no iodine being stored in a women's breasts. Men store iodine in their prostate gland. Prostate cancer is related to no iodine in the prostrate. Only 10% of the iodine that is added to refined salt is bio-available. We need naturally, unrefined salt in our diet. Vegan and vegetarian diets are often low in iodine. 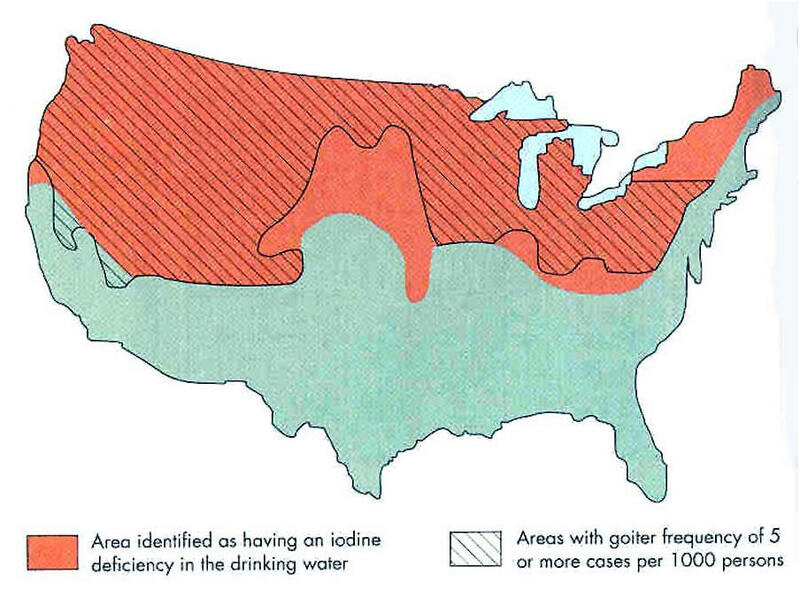 Our soil is deficient in iodine especially in the Midwestern USA. Bromide, chloride and fluoride are all inhibitors of iodine. Pollution and pesticides contain bromine. Bromine was added to bakery products in the 1970's and this significantly reduces iodine in the body. Iodine levels have dropped 50% in the past 30 years in the USA! Enough iodine in the body will help the body to detox bromide, chloride, fluoride and mercury, in particularly from vaccinations. Mercury will impair the enzyme that is needed for iodine processing in the body. You can test your iodine level easily with a urine test that is now available through FFP Laboratory. You may call (877) 900-5556 or use the FFP Laboratory website as an individual and order the test kit yourself. The results can only be given to a physician. If you do not have a physician that will accept your test results you may request to FFP's Medical Director, Dr. Jorge Flechas M.D. The 2 tests recommended are the SPOT TEST and the LOADING TEST, both are urine tests for $120. You will also need to buy the loading packet of 4 supplements for $2.50. The SPOT test is the first urine void of the day. This first void measures the level of iodine in the urine to ascertain if the level is sufficient to prevent a goiter. This test can also be used a predictor of possible risk for the development of breast cancer. If results are under the stated "norm", either or both of these conditions should be considered. The LOADING test is a measurement of whole body sufficiency for iodine. The goal for the whole body sufficiency is to obtain 45 mg or greater LOADING excretion result, with 90% or greater result. Bromide toxicity urine testing for $128 and fluoride toxicity urine testing $120 can be done at the same time, in the same samples when done with FFP Labs using the same urine samples. This test should be done after the Urine Iodine Spot and Loading Test have been completed and results indicated that a symporter defect may be present. This procedure is a functional test of the Sodium Iodide Symporter, the NIS. The NIS has the ability to concentrate Iodide 20-40 fold in the thyroid as compared to the serum. The NIS is also present in the salivary glands and many other tissues inside the body. By measuring the amount of Iodide in the serum and saliva we are able to develop a ratio, which will help us know if the symporter is working properly. The thyroid uses Iodide in the making of thyroid hormone. The symporter is also present in breast tissue. The absence of Iodide in the thyroid would manifest as hypothyroidism, thyroid nodule, and goiter. The absence of Iodine in the breast would manifest as cyst, nodules, and scar tissue in the breast. This particular test will help you target specifically a person who will need therapy to repair their NIS function. This test is done by a blood and saliva sample. You can order the kit from FFP Labs under Dr. Flechas and take it to your primary Health Care Provider to have your blood drawn. This is a different type of testing and test kit from the Iodine Test. Only Dr. Flechas FFP Labs, during your consult will be able to tell you a suspected Symporter defect. Iodine is an essential element. Its main function is in the production of thyroid hormones by the thyroid gland, but many other organs in the body have a need for iodine in order to function normally. The thyroid gland needs iodide to function properly. The original study done 80 years ago to control goiter in adolescent girls used 9 mg iodide daily. Several studies have demonstrated a relationship between low iodine intake and fibrocystic disease of the breast (FDB), both in women and laboratory animals. 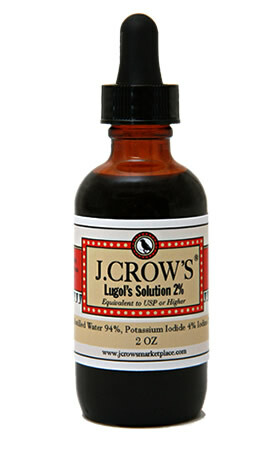 During the early 1900's, the iodine/iodide solution called Lugol solution was used extensively, effectively and safely in medical practice, for both low activity and above normal activity of the thyroid gland. The recommended daily intake for iodine supplementation was 2 to 6 drops of Lugol Solution which contained 12.5 to 37.5 mg total iodide. That amount was mentioned as lately as 1995 in a book on Pharmaceutical Sciences. Tableted Lugol's are called "Iodorol" and are also available online and there is not taste, so compliance is better. Each capsule contains 12.5 mg of iodine and iodide. It is also sold in 50 mg pills. Several investigators have shown convincing evidence connecting inadequate iodine intake and breast cancer. Japanese women living in Japan consumed a daily average of 13.8 mg total elemental iodine and they experience one of the lowest prevalence (risk) for breast, ovarian and uterine cancer. In the 1960's, one slice of bread in the USA contained the full RDA of 0.15 mg iodine. The risk for breast cancer was then 1 in 20. Over the last 2 decades, iodine was replaced by bromine in the bread making process. Bromine blocks thyroid function and may interfere with the anticancer effect of iodine on the breast. Currently, the risk for breast cancer is 1 in 8 and increasing 1% per year. The RDA limits for vitamins and minerals were established after World War II and one of the last essential elements included in the RDA system was iodine, established in 1980 and confirmed in 1989. The recommended daily allowance (RDA) is only 50 mcg per day for iodine and this was based on the amount of iodine/iodide needed to prevent goiter, extreme stupidity and hypothyroidism. This amount is not adequate! The optimal requirement of the whole human body for iodine has never been studied. Therefore, the optimal amount of this element for physical and mental wellbeing is unknown. Based on demographic studies, the mainland Japanese consumed an average of 13.8 mg daily and they are one of the healthiest people in all countries. Iodine is an essential mineral that’s vital to the proper functioning of the thyroid. The thyroid gland is responsible for managing growth and metabolism. An iodine deficiency can cause symptoms such as fatigue, high cholesterol, lethargy, depression, and swelling of the thyroid gland. Prevent this dangerous deficiency by eating the right amount of iodine rich foods each day. Iodine is an essential part of a healthy, balanced diet. Since the body cannot synthesize this mineral, it’s important to include various iodine rich foods in your diet each day. Fortunately, there are many fruits, vegetables, dairy products, and seafood options that make it easy to get the iodine your body needs each day. one medium potato provides 60 micrograms of iodine. one cup of milk contains an impressive 56 micrograms of the mineral, or about 37% of what the average person must consume each day. A quarter-ounce serving contains 4,500 micrograms of iodine. Consume smaller portions over time in order to gain the health benefits. A three-ounce serving size of cod provides your body with 99 micrograms of iodine. Cod is also a healthy source of protein, calcium, magnesium, potassium, and Vitamin E.
Many brands of salt are fortified with the essential mineral iodine and 1 gram has 77 micrograms of iodine. A three-ounce serving of shrimp provides 35 micrograms of iodine. Shrimp also provides your body with other essential minerals, primarily protein and calcium. Himalayan crystal salt is a viable alternative. Half a gram of Himalayan crystal salt provides 250 micrograms of iodine. Three ounces of baked turkey breast meat provides 34 micrograms of essential iodine. Turkey also provides your body with B-vitamins, potassium, and phosphorus, all of which are essential to a strong and healthy body. Just 5 dried prunes provide 13 micrograms of iodine for your body with essential fiber, boron, Vitamin A, Vitamin K, and much more. Enjoy a half-cup serving with any meal, and you’ll provide 32 micrograms of iodine plus protein, copper, potassium, calcium, folate, and iodine. Two fish sticks can supply your body with 35 micrograms of iodine. Tuna that is canned in oil usually contains more iodine than when it’s canned in water. Three ounces of canned tuna provides 17 micrograms of iodine, has high protein, Vitamin D and iron contents. One hardboiled egg provides just under 12 micrograms of the iodine needed for the day. A cup of plain yogurt provides 154 micrograms of iodine. Bananas contain iodine, making them a healthy and nutrient-rich food to supplement. A medium-sized banana contains 3 micrograms of essential iodine. Strawberries are a nutritious fruit that provides your body with many vitamins and minerals. A 1 cup serving contains 13 micrograms of iodine. Just half a cup of canned corn a provides 14 micrograms of iodine. Lobster at a 100-gram serving provides 100 micrograms of the essential mineral. Cheddar cheese in one ounce of cheddar cheese provides 12 micrograms of iodine. Cranberries have 400 micrograms of iodine in a four ounce serving. They have a high concentration of Vitamin C, Vitamin K, and fiber, and they’re known to prevent urinary tract infections. A half-cup serving contains 3 micrograms of iodine. And they are a great source of Vitamin C, potassium, and folate. We recommend that you do not begin supplementation unless you have done a urine loading test for iodine deficiency and have supervision. The thyroid gland and the body needs iodide to function properly. The thyroid gland can store 50 mg of iodine, the whole body 1500 mg. Therapeutic supplementation of iodine are typically between 6 - 50 mg per day depending on the case and under the supervision of your health care practitioner, with proper urine testing done prior to supplementation. 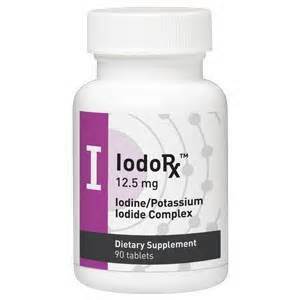 To supplement iodine and iodide, use tablet form called Iodoral or IodoRX. Another option is the liquid solution called "Lugol's Solution". Both are available on the internet as non-prescription nutritional supplements, BUT supervision by a health care practitioner is strongly urged. The Iodoral or IodoRX has no taste and does not cause gastric upset which can sometimes occur for some people on the Lugol's Solution. Each tablet of Iodoral or IodoRX contains 12.5 mg. Iodoral or IodoRX also comes in 25 mg and 50 mg doses on the internet. To prevent gastric irritation, the iodine/iodide preparation is absorbed into a colloidal silica excipient and to eliminate the unpleasant taste of iodine, the tablets are coated with a thin film of pharmaceutical glaze. Lugols' Solution comes in 2 types: a 5% and a 2% solution. One (1) drop of the 5% Lugol's Solution contains 6.25 mg (2 drops contain 12.5 mg.) One (1) drop of the 2% Lugol's Solution contains 2.5 mg (2 drops contain 5 mg.) It has a taste to it, but can be diluted in water or juice if needed to cover the taste. These Iodine specialists have recently discovered it is very helpful to have the Iodine Spot and 24-hour Loading Test before implementing iodine supplementation in order to investigate the presence of a possible iodine absorption defects. If a person is going to start Iodine Therapy, it is highly recommended having a thyroid panel test done as well for TSH, T4 and Free T3. Iodoral or IodoRX will enhance the response of any thyroid hormones taken. You may need to cut down on the amount of thyroid hormones being taken if you experience palpitation, anxiety, increase sweating and intolerance to heat. This is all because Iodoral or IodoRX decreases your need for thyroid hormones. It is recommended that you reevaluate after 1 month if you are on thyroid hormones and starting Iodoral or IodoRX. It is recommended that you reevaluate with your health care practitioner after about 3 months of supplementation with Iodoral or IodoRX if you are not on any thyroid hormones, and at 1 month if you are. These three iodine research doctors: Dr. Guy Abraham, Dr. David Brownstein and Dr. Jorge Flechas have treated more than 4,000 patients with iodine supplementation. The supplementation protocol is from their writings and lectures. Once you start supplementing with iodine, you should also be on approximately ½ of unrefined salt (Celtic sea salt, pink Himalayan, Redmond’s) to assist in the removal of toxins released by iodine. Not all sea salt is unrefined. It should be gray, red or black in color. If it is white, it is likely refined. Unrefined salt helps bind toxins so they can effectively exit the body. It also contains a full spectrum of minerals. These minerals help to maintain balance in the body and do not react like a refined salt. You should NOT use any white (REFINED) table salt. This is a toxic substance that has been cleaned by a brine containing chloride. You should not experience hypertension or swelling from a good unrefined salt. If you do, contact your health care provider. Unrefined salt is also healing for the adrenals which can become stressed during detoxing and through daily stresses of modern life. Certain other key minerals and supplements are required by the to improve detoxification while supplementing iodine. You must have adequate unrefined sea salt intake daily such as Celtic sea salt, Himalayan, Redmond’s, etc. to support your detox and adrenal function. An easy way to provide this essential support is measure out each day and use 1/2 tsp of unrefined salt daily (adult amount) on your food. Adequate water intake for your weight is essential for detox. Your minimum water intake should be half your weight, in ounces, drunk per day. B Complex vitamins are essential in detox. They must have the correct forms of B9 (methylfolate) and B12 (methylcobalamin) especially for those with the MTHFR genetic mutations - you should NOT be taking supplements with folic acid or foods high in folic acid (i.e. asin white flour products). Avoid all white flour products during detoxification and beyond. Many white flour products are brominated which reduces iodine in the body AND contain folic acid, which decreased the methylation cycle in the body for detoxification. Avoid all chlorinated or brominated pools or hot tubs during detox during and after detox. Avoid all fluoridated water, tooth paste, fluoride dental treatments during and after detox. Avoid all birth control pills, synthetic hormones, hormone replacement therapy, fluoride based medical drugs (like Prozac) or bromide based medical drugs including most asthma inhalers. Always research what prescription drugs are made of before agreeing to take them! Avoid fruits and wines treated with pesticides during and after detox. Eat organic fruit and produce whenever possible! Other supplements needed to support detox pathways and key organs are: Magnesium, Omega-3's, Selenium, Vitamin C (in the form of sodium ascorbate), Vitamin D and Zinc. Always consult your practitioner for their recommendation! Always consult your health care practitioner for their professional advice! Salt loading is done to help when the individual is feeling overloaded by the toxins being released from supplementing with iodine. It is only done a few days at a time to relieve the detox symptoms. If your iodine detox is happening too fast, and you are uncomfortable, a rash develops, swelling, etc. then we recommend that you stop the supplements for 1 or 2 days. If there is a detox aggravation, then the dosage of iodine should be reduced to slow the release of toxins down and not overload the detoxification pathways. Again, always consult your health care practitioner for their professional advice in your case. Add ½ tsp of unrefined salt into 4 ounces of warm water. Drink the mixture and follow it up with a 12 oz glass of filtered water. Repeat every 30-45 minutes as needed until urination begins. "The Underutilized Mineral for Health: Iodine"
Note: This is a very similar presentation to the one above that is 1 hour 30 minutes by Dr. Brownstein.